The Georgis kindly invited PRISE to their house, filled with delicious monkey bread and other treats. This just might be my only shot of Greg when he’s not giving a talk! Undergrads of the Saghatelian Lab, with their mentor. PRISE went with a bang. No one expected such an elaborate dinner to top off a great summer. Everything was immaculate, from the butter to the dry ice to the color coordination of lights, flowers, and tablecloths. Rob Lue tuned in from Shanghai to talk with us. We are so lucky. Thanks for a great summer, PRISE! Good times. Wow – summer is quickly drawing to a close. PRISE is making use of every spare minute, jam-packing yet another week. Click on the photos to see the full Picasa album! 08/03. Presentation Practicum – Photo credits to Michael! 08/04. Lunch with Marc Hauser. 08/08. Dancing in the Moonlight. This event was so well done, from food to decorations to music! Everyone had a great time. 08/09 Tanglewood! Although it was threatening to storm all day, it never actually got past a drizzle. Great company, great music. Take a look at the album for some fun pictures! 08/09. Finale Study Break, the last one. I wish I could have captured the crowd as we swarmed the table at 9:20 sharp. A huge thanks to all the PA’s who have worked so hard to throw us a study break every weekend! 07/27. Greg gives our Monday night seminar – how to give a presentation. 07/19. Professor Kronforst talks about his lab’s work with Heliconius butterflies. (cont’d) Jeremy hosted the event, and brought ice cream cake from J.P. Licks! 07/30. Professor Stephen Kosslyn gives us very valuable advice on creating PowerPoint presentations. Everyone got copies of his book! Professor Kosslyn kindly signs his book for Namrata and Vijay. There are many more fun pictures of the epic water balloon fight than the ones posted here – take a look at them! The water ballooners, before the fight. Joe blocks a balloon with his bare hands. The PRISE Bowling excursion really was an excursion. It involved getting lost four different ways, jumping over a mud puddles, crossing over a bridge, and trekking through a reservation. We all had a great time! Bowling was so much fun! DA, Namrata, and Eshwan explosion! Ameya is not amused. Taking photos is so much more fun now that I’m getting to know you guys and am not taking pictures of strangers! More fun photos of the bowling trip here. Thanks to Tzuying, Mike, and Jeremy for contributing their photos! See Mike’s other photos of whale watching and dinners with Professor Malan. This photo dates all the way back to June 13 – the Boston Pops Apollo 11 Anniversary Concert. It rivaled 4th of July in patriotism. See Tzuying’s pictures from the Boston Pops concert and RENT! 07/18. 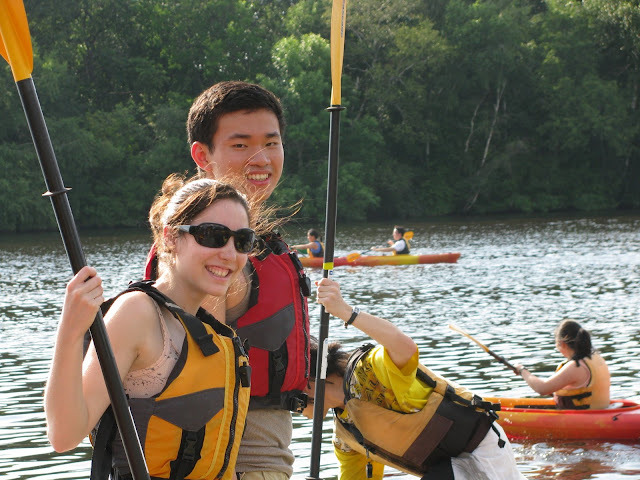 A Canoeing on the Charles – just one of the many events that Jeremy has helped to organize! See the rest of Jeremy’s photos from the canoeing trip! 07/19. Happy stomachs at Spice study break! 07/20. Careers Off the Bench. Three amazing women. 07/21. Citizen Schools Summit: A great event that PRISE infused with its collective passion for science. This is a generally unflattering picture of everyone seated in this row, but it just shows the solid PRISE turnout at the event. Nico and Nan prepare to present their proposal: designing a compost system and then implementing it in the middle school. 07.21. Hyperdodecahedron! A brilliant idea, and very well implemented to boot! The mastermind himself! Actually, this is Zach a week before the event. 07/23. Distinguished Speaker Series: Adam Cohen. Click on the photos to see the rest of the pictures! Or, alternatively, you can just go to the album homepage. 07-17. Prajakta, Amea, Mimmie, Vernon, and Gerald are fascinated by illusions at Night at the Museum of Science. Sorry if you’re coming here and looking for recent pictures – my computer is out of commission at the moment. Pictures will be up around the middle of this week! And the Apple store has informed me that they will be keeping my computer for a few days longer; sorry about this.